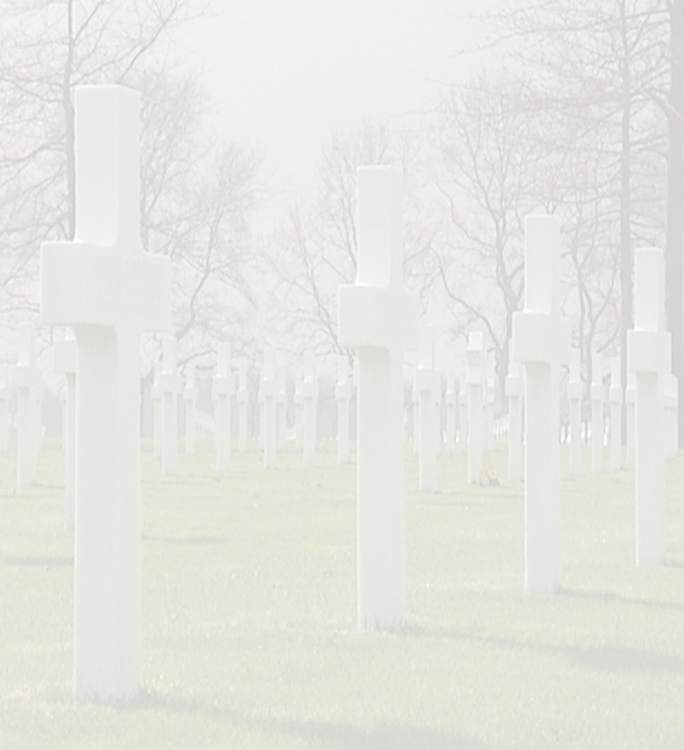 It was in January 2005 when we received the adoption certificate from the Foundation Adoption Graves American Cemetery Margraten. The first thing I noticed was the day he died, May 3rd 1945. How ironic and saddening it is that Harry died just a few days before the end of the war. It was a strange kind of excitement I felt when I called my brother to tell him we received the adoption certificate. My brother and I decided to do this adoption together. Somehow we share the same interest in WWII and felt that we should remember and honor the fallen soldiers this way. With just one name, all of a sudden one of the more than 8000 headstones starts to get meaningfull. 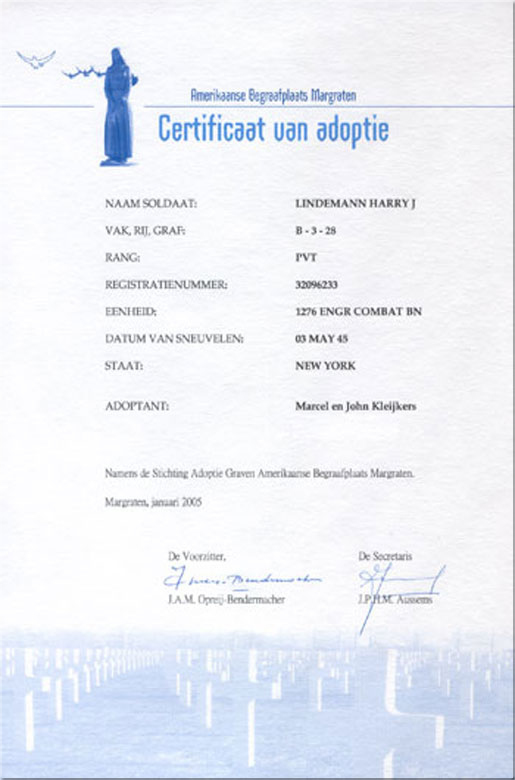 At the same instance a PVT Harry J. Lindemann is becomming a special person to you. At this point all we wanted to do was to try and trace back anything we could about Harry and the 1276th engr. Combat BN. After a couple of days of intense searching on the internet, it became clear to us that it was going to be hard to find more information than we already had. 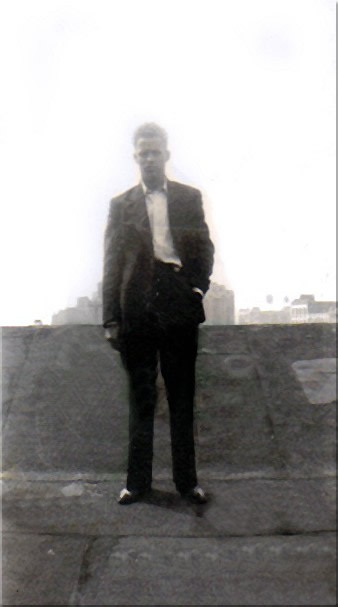 Harry J. Lindemann was born on April 8th 1918 in Manhattan Borough, New York City. His father Charles was a house janitor and his mother Mary was a waitress. He also had a 4 year older sister by the name of Ruth. Harry entered service on June 19th 1941 at Fort Jay Governors Island, New York. Later to be transfered to Iceland to join the 1276th Engineer Combat Battalion. The 1276th Engineer Combat Battalion was envolved from the 2nd Engineer Regiment which was formed for action in the Mexican War in 1847 and the 5th Engineers which was organized in 1861 shortly before the start of the Civil War. One of the earliest commanding officers of the 2nd Engineers during the Mexican War was Winfield Scott. He later became Commander-in-Chief of the Union Army in 1861. The 5th Engineers participated in several engagements during the Civil War where they distinguished themselves with honor. The 5th also served in the Spanish American War as well as the Philippine Insurrection.In 1918 during World WAR I, the Battalion was engaged constantly during the Meuse-Argonne offensive. The Unit was de-activated in 1921 and it did not become activated again until January 11, 1936 where again it was designated as the 5th Engineers. It was stationed at Ft. Belvoir, Virginia. In July, 1941, the 1st Battalion of the 5th was detached to other fighting units and sent overseas to Iceland to relieve British troops that were scheduled to fight in North Africa against the Germans. On December 6th, 1941, the 2nd Battalion was also assigned to Iceland, shortly after the Japanese attack on Pearl Harbor. 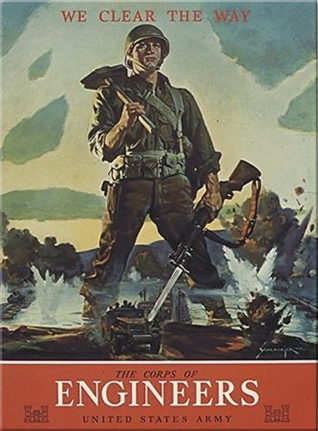 In August, 1943, the 5th Engineers, after receiving draftee replacements, was re-designated as the 5th Engineer Combat regiment and the Unit was at full strenght and ready for action. In November, 1943, after two years of occupation duty, the 5th Engineer Combat Regiment was reorganized, this time into two Battalions, the 1276th and 1278th, and eventually had orders to sail for England. Both Units fought with distinction from the initial landings in France until the final victory on the Elbe River in Germany in 1945. Under the skillful command of Col. Nicholas Paraska, the 1276th carried out their assignments well. They served as forward combat engineers during the assault crossings of the Roer and Rhine Rivers for the 102nd Infantry and 30th Infantry Divisions respectively. At one time they were one of the oldest overseas units to fight on the Western Front in World War II. After the river crossing and the establishment of a bridgehead, the Unit was disbanded september 18th 1945, at Ebernay, France. The Unit suffered a 22% casualty rate during the military operations and it received about 180 military decorations, including a Presidential Unit Citation, for its work during the Roer River Campaign. The fallen Unit members are buried in Margraten Cemetery and in Henri-Chapelle. Air Strip Repair in Vicinity of Gifhorn. are cited for outstanding performance of duty in action on 23 and 24 February 1945, during the crossing of the Roer River at Rurdorf, Germany and the establishment of a bridgehead in that vicinity. With only two possible crossing sites in the sector, one of which was rendered useless by the destruction of a dam and the resulting inundation of large portions of the river valley, the regiment was forced to cross in column of companies on a one-company front. When leading elements started crossing in assault boats at 0330, 23 February 1945, the enemy reacted quickly and laid down a terrific barrage on the single crossing site. Braving this deadly hail of fire and struggling against..... the treacherous current of the flooded river, the regiment succeeded in crossing by sheer courage and determination. Beating off a strong counterattack, the regiment continued its attack, driving through the Tetz-Boslar Valley and capturing the town of Boslar and the high ground to the northwest. Unable to proceed beyond Boslar because of withering fire from enemy tanks and infantry on the high ground to the northeast, the regiment dug in, with orders to hold at all costs- pending the arrival of tanks, tank destroyers, antitank guns, and other supporting weapons, which had been unable to cross the river. Quickly launching a counterattack against Boslar, the enemy succeeded in penetrating the forward positions, but, after a vicious fight, was forced to withdraw. Later, another_ attack was launched against Boslar, but was stopped before it reached the town. Still later, a third attack was launched against the same sector, which was led by some 30 tanks and self-propelled guns, followed closely by about 200 infantrymen. Striking with great force, the enemy quickly overran forward positions and penetrated as far as the battalion reserve line. Forward elements and company supports, refusing to yield an inch of ground, allowed themselves to be overrun and then emerged from their positions to engage enemy infantry from the front, flanks, and rear. Fierce fighting raged throughout the town. Calling for artillery fire to be laid on their own positions, the defenders finally succeeded in clearing the town and forcing the enemy to withdraw. The enemy launched four additional attacks against Boslar during the night. Three were thrown back before reaching the town and the fourth, although penetrating it slightly, was finally repulsed by the same relentless, unwavering determination and repeated individual feats of heroism which characterized the entire action. After doing research for more than one and a half years and almost giving up hope, we finally found Harry’s daughter, Marie Maselli, in august 2006 and we were all so excited to hear from her. We were even more happy that she responded in a very warm manner. All of us were very emotional, especially when we learned about the passing away of Harry's wife (Also named Marie), about two years ago. How we would have loved to get in touch with her and tell her that her husbands grave was well taken care of. Marie told us that she had spoken to her mother’s sister about us looking for relatives of Harry and she also became very excited. She asked Marie to tell us some things about Harry; His nickname was “Butch” and she remembered him as being a hell-raiser when he was young. 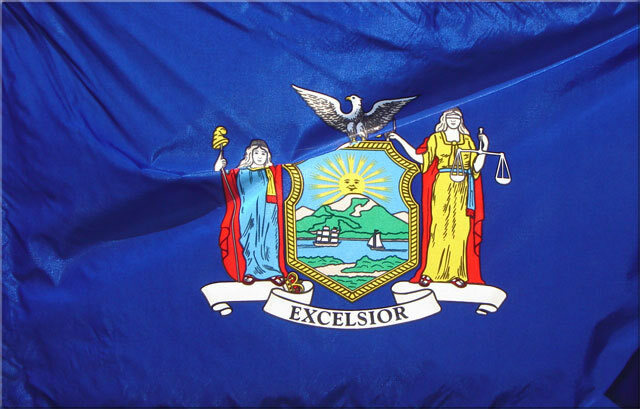 They both lived in New York City very close to the Hudson River, where he would swing from a thick rope and yell “way Marie” and jump into the water. The song must have been very popular then. Dean Martin, the singer, sang that song in Italian and English. Harry also had a sister called Ruth, however they lost contact with her many years ago. When Harry’s mother Mary, became ill, Marie’s mother took her to her apartment in NYC and cared for her. She got better and they both decided to move to New Jersey where they both lived for about 6 years when Harry’s mom past away after the loving care of Marie. Harry would have been very happy about this. 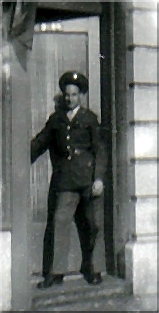 From the military reports and individual personnel files which have been send to us, it became clear that Harry died non-battle in the vicinity of Hannover. The cause of death was a vehicle accident. 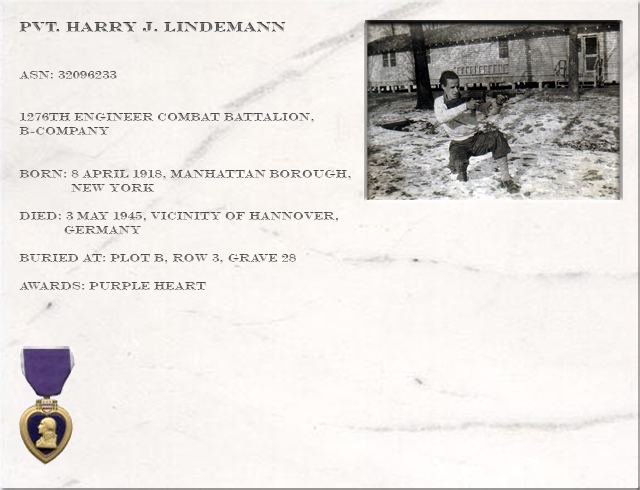 If there is anyone who can add something to the story of either Harry J. Lindemann or the 1276th Engineers Combat Battalion, please contact the webmaster of this site. In August 2010 Mrs. Marie Maselli died at the age of 70. Mr. Eddie Acosta, Mr. Salvadore Acosta; of the 1276th Engineer Combat Battalion Association. Mr. Joe "Shadrack" Heidenreich; of the 1276th Engineer Combat Battalion Association. Mrs. Jo Ann Snyder and Mr. Louis Franklin Turner for all their time and effort doing research.